I'm going to present a few curious things to you about what surrounds you that I'll bet you don't know. It's time to discover the planet closest to the Sun and therefore the hardest to observe: Mercury. Mercury is the fastest planet, swinging around the Sun in just under 3 months. It's so close that it's within the Sun's warped space. For a long time, people thought there was an even-closer planet that was perturbing Mercury's orbit, a truly hellish world they dubbed Vulcan. However, Vulcan was never discovered, because it wasn't there to be found, yet Mercury's orbit was still not conforming to Newton's predictions. Something else was going on. It wasn't until Einstein's Theory of Relativity that the answer was found. You've heard that a circle is 360 degrees around, right? Well, massive objects like the Sun distort the space around them. 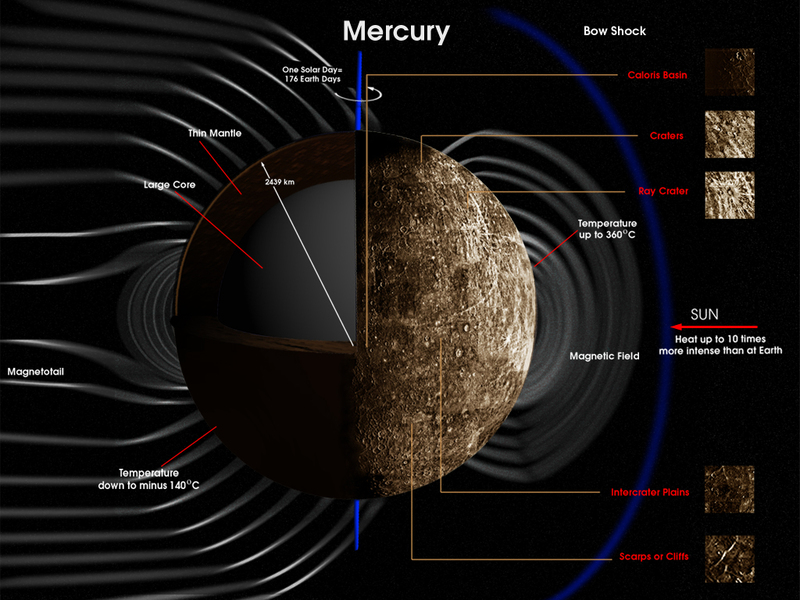 Close to the Sun, where Mercury is, a complete circle is slightly less than 360 degrees, and as a result, Newton couldn't predict where Mercury would be. Here's something else you don't know about Mercury: it experiences a double sunrise and a double sunset every day. How? This will only take a moment to explain. Mercury is a big rock, much like the Moon, except it’s really hot because it’s so close to the Sun. The Earth’s distance to the Sun, the famous 93 million miles, has a much easier name to remember, called the AU, which means Astronomical Unit. Earth is 1 AU from the Sun. Mercury is about 2/5 of this distance, and as a consequence, it zooms around the Sun in only 88 Earth-days, which is just under 3 months. Mercury rotates very slowly compared to Earth. The Earth rotates in 24 hours - one day - but Mercury needs about 59 Earth-days to turn a full 360 degrees. This means a Mercury-day is very long, about 2 months. Did you notice something there? Its day is 2 months and its year is 3 months? That means that Mercury has 3 “days” for every 2 “years”. Those are incredibly long days! One other thing you need to know: in its travels around the Sun, Mercury’s orbit is not a perfect circle. Sometimes it’s closer to the Sun than normal, and sometimes it’s farther away. When it’s closer, it goes faster, and when it’s farther, it goes slower. This makes its orbit somewhat elliptical. Click here to see the Moon’s libration! When Mercury rotates, the Sun comes up over the horizon very slowly. When it is close to the Sun, its increased orbital speed is fast enough that when seen from the ground, the Sun goes back down! Then when the planet moves farther away from the Sun, it slows down and now the sunrise can continue. The same thing happens in reverse on the other side of the planet with the sunset. To put it another way, the Sun heads west across the sky, then when Mercury is close to the Sun and outrunning its rotation, the Sun goes east for a while, then when Mercury moves away from the Sun, the Sun heads west again. And so, Mercury’s double-sunrise and double-sunset are caused by this combination of very slow rotation, very fast revolution around the Sun, and orbiting faster than it can spin for a small part of the local “day”. It’s important to note that, because of the relationship between its “day” and it’s “year” — it’s a ratio of 3 to 2 known as a resonance — this means that these doubles are visible only from small portions of the planet’s surface, and nowhere else. Anywhere else on the day side, you’ll instead see the Sun going backwards for a little while before it resumes its trek across the sky. This isn’t like a Solar eclipse of the Moon, which can happen pretty much anywhere on Earth in narrow swaths for a given event; if you build your house somewhere on Mercury where you saw a double-sunrise, you’ll always be able to see these double sunrises from your house every other “year”. I haven’t done the math to see if double-sunrises and double-sunsets can be seen from the same locations, but it seems unlikely. Bonus points for those of you who were also able to figure out that, on certain small locations on the Moon, you can watch the Earth rise and fall over the horizon over the course of a lunar “day” in the same manner! I think that's enough knowledge to boggle your mind about Mercury. Next up: Venus.